7 Ways To Get Free Starbucks Gift Cards + Proof They Pay! 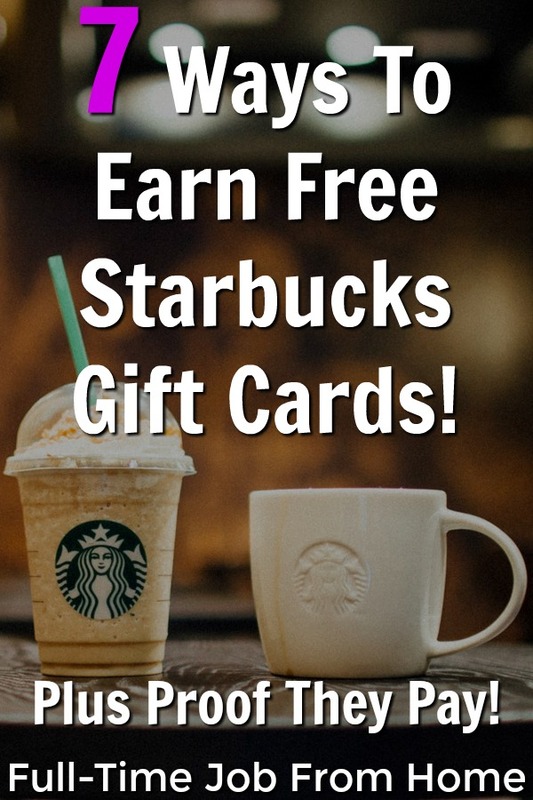 If you frequent Starbucks and are interested in making money online, I have an awesome post for you with seven ways to earn free Starbucks gift cards to fuel your addiction! Below I’ll cover all of these sites in detail, show you how you can earn, cover how to join, and show you proof that they pay! Most of the sites listed below also have other ways to get paid, even though you’re here for Starbucks gift cards, I’ll also cover those. Let’s get started with this list of ways to earn free Starbucks gift cards, if you have any questions, don’t be afraid to leave comments below! Swagbucks is one of the more popular sites on this list and is a rewards site that pays you to watch videos, search the internet, answer surveys, refer friends, play games, online shop, and more. Swagbucks by far has the most reward options including PayPal and 100s of gift cards, which includes Starbucks gift cards starting at $5. To learn more or to join, visit Swagbucks.com! You can earn a $5 sign-up bonus when you join through this link! InstaGC is a rewards site that is available worldwide so anyone reading this should be able to join and earn. InstaGC pays you to complete tasks, download apps, cash back shopping, visit websites, watch videos, and refer friends. InstaGC has cash payments via PayPal and Bitcoin and also has several gift card options, including Starbucks, starting at just $5! PrizeRebel is a rewards site that recently revamped their site, and I’ve started using it over the last year or so. They pay you to complete surveys, offers, tasks, watch videos, refer friends, and have raffles where you can win big. PrizeRebel has over 50 gift cards that you can redeem, including Starbucks starting at just $5. You can also get paid via PayPal! FeaturePoints is an app and website that offers several ways to earn including downloading apps, playing games, taking surveys, cash back shopping, referring friends, and watching videos. They have cash payments via PayPal starting at $1 and have tons of gift card options including Starbucks starting at $5. You can even get paid via Bitcoin if you’d like. Ibotta is an app that pays you cash back on your in-store grocery shopping along with other products in health and beauty, electronics, baby, and other categories. All you need to do is purchase items listed inside the Ibotta app and take a picture of the receipt to earn. Most rebates pay $.25-$5 depending on the price of the item. Once you earn $20, you can get paid via PayPal, Venmo, and gift cards to several stores including Starbucks! To learn more or to join, visit Ibotta.com! You’ll earn a $10 sign up bonus once you redeem your first rebate! Drop is an app that pays you automatic cash back when you shop at participating stores. It’s “automatic” cash back because you do not have to scan your receipt. All you need to do is add your credit/debit card, and you’ll earn cash back on your total purchase. Some of the participating retailers include Target, McDonald’s, Walmart, Uber, Walgreens, and many more! Once you earn $5, you can get paid via gift cards to several stores including Starbucks. To learn more or to join, visit Drop.com to earn a $1 sign-up bonus! Earnably is a rewards site that pays you to complete tasks, offers, take surveys, watch videos, download apps, and refer friends. It’s available in most countries, which makes it perfect for all of my readers. Once you earn $1, you can get paid via PayPal or Amazon gift card. 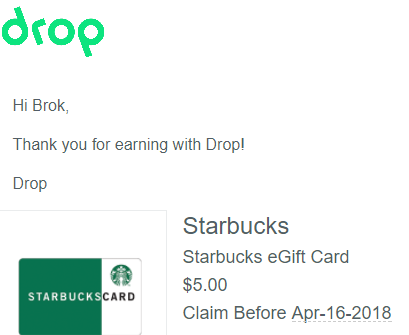 Once you earn $5, you can cash out Starbucks gift cards directly to your email, along with several other gift cards. I hope you enjoyed this list of ways to earn extra money online and get paid via Starbucks gift cards. If you have any questions about the sites on this list, don’t be afraid to leave comments below. If none of these extra income sites seem like your thing, make sure to check out the helpful links below. 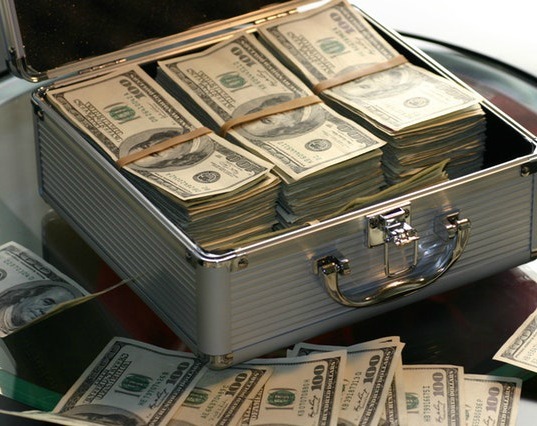 There’re several other ways to make money online that might be more for you! Do you know of any other legitimate extra income sites that pay via Starbucks gift card? I’d love to hear your thoughts and suggestions in the comments below!